Sunset on Comb Ridge, from Comb Wash. The Highway 95 cut through Comb Ridge. The Abajo Mountains, winter sunset from Highway 95. It was late January and I was on Utah Highway 95 between Blanding and Natural Bridges. The approximate halfway point of that drive is the cut through Comb Ridge, and on this trip I was approaching it just as the sunset was only a few minutes away. Comb Ridge’s western face is a sheer wall of Wingate sandstone that is about 90 miles long, running north to south from southern San Juan County, Utah across the San Juan River into the Navajo Nation lands in northern Arizona. 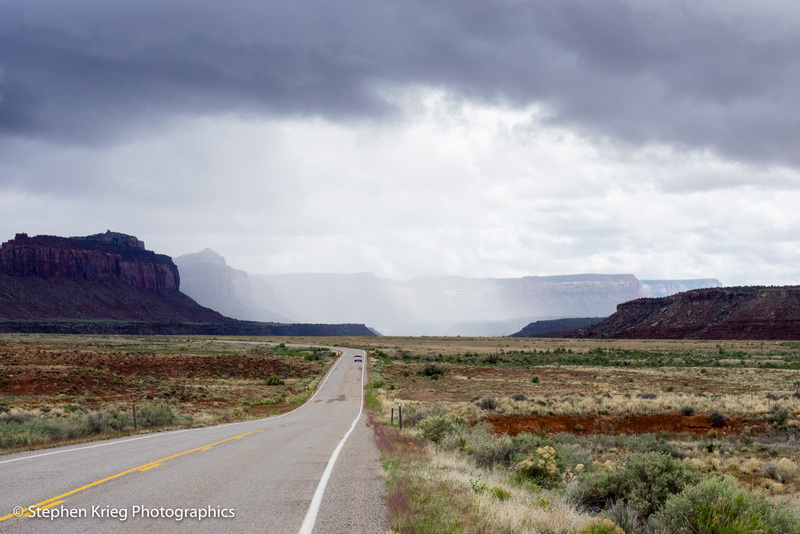 As with almost everywhere in southern Utah’s canyon country, you don’t have to care one bit about geology to be impressed by the endless variety of shapes and colors of the canyons, mesa, buttes and mountains. Especially at sunset time. After crossing Comb Ridge from west to east, the last rays of sunset lit up the snowy peaks of the Abajo Mountains near Blanding. Cedar Mesa sunset shower panorama. Sunset colors–good ones–had been sorely lacking in these parts this spring. I’m not used to that. Not in the high desert, with all the clear air and clouds of an uncommonly wet springtime. So when some rain showers approached in the evening, I thought it was worth another try. You never know what might happen. Never bet against sunset, that’s my motto. One of them. So out at Maverick Point, with its splendid unobstructed view to the west, I once again set up the camera on tripod. A lovely rain curtain was falling toward distant Monument Valley, lit slightly golden by the low angle of the setting sun. A good start to the session. Moss Back Butte and evening rain shower. Then another light gray rain curtain in between me and Moss Back Butte. I love to watch rain curtains in the distance. After a little while there was thunder, which meant I was in the danger zone for lightning. Me and my aluminum tripod. So after several more shots I retreated to the truck to watch the evening progress. Rain drops streaked down the passenger side window and the wind came up. See, I didn’t want to get my camera wet anyway. So much safer inside a vehicle when lightning might be about. I drove up onto Maverick Point itself for a higher view. The sunset colors near the distant Henry Mountains was interesting. Not killer, but nice. Henry Mountains sunset colors, from Cedar Mesa. On the point was a new fire ring. Not the usual crude thing, but a work of art. Flat sandstone slivers made into a circular hearth. 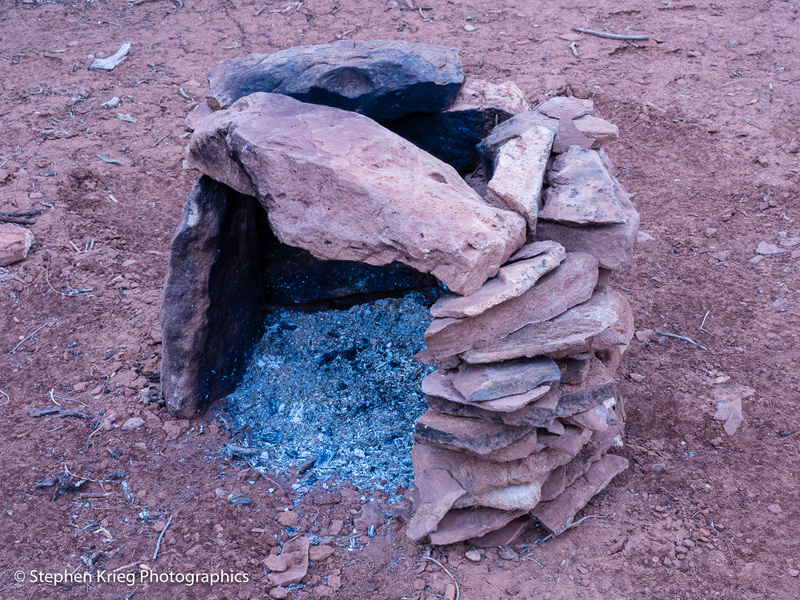 Another oblong rock across the top made it into a grill to cook a pot of stew on. It was new; I’d been back to this spot very recently. A very nice place to camp with a tent, not far from a parked vehicle. Fire ring artwork on Photographer’s Point. And I’ve dubbed this particular viewpoint on Maverick Point as Photographer’s Point. This is just between you and me, right? 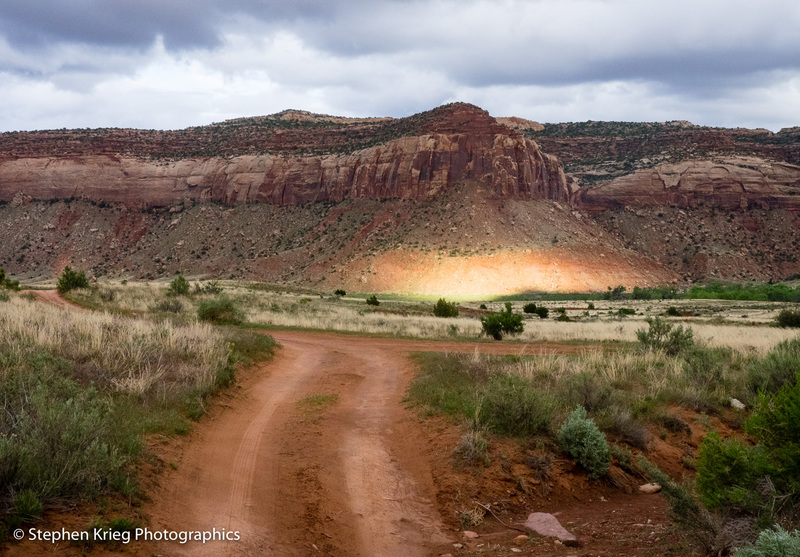 Photo location: Cedar Mesa, San Juan County, Utah. One of my personal philosophies is to keep revisiting favorite places, especially in different seasons. Thus it was time to return to the Needles district of Canyonlands National Park. Though this post is not about my time inside the park. Oh, no. Because I feel like writing about what came afterward. It was that kind of day. So I left the park and returned east on highway 211. A rain shower was falling up ahead and the afternoon sunlight was pouring through it. Naturally I had to pull over and do something about it. Photograph it, I mean. It had been a rainy spring day, and so driving on the dirt roads branching off from the highway was nothing to be trifled with. On the way in I had tested out the lower portion of the Beef Basin road, and had quickly been sliding around, even with All Wheel Drive. But after a few hours things had firmed up. I found a nice camping spot and prepared to settle in for the night. Nobody around. Peacefully perfect. And a very expansive view of the valley and red rock cliffs towering all around. I didn’t choose this spot for nothing. 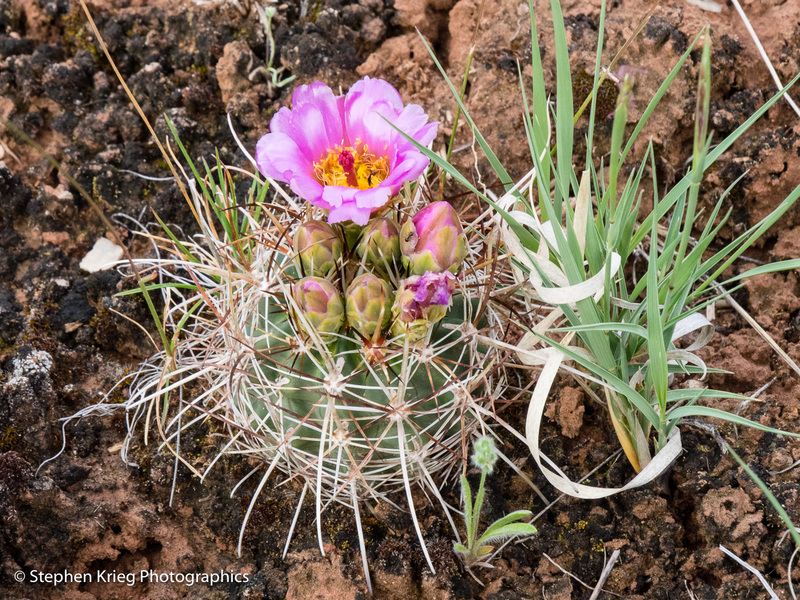 The rare wet spring in the high desert had things blooming. Plus the wet earth and vegetation made the colors more saturated. I had water, food, music, and of course photo gear. I wouldn’t play any music until after dark, preferring the sound of the wind and birds. The campsite was well used. And hadn’t been cleaned up that well, so I did. Leave a place better than you found it. 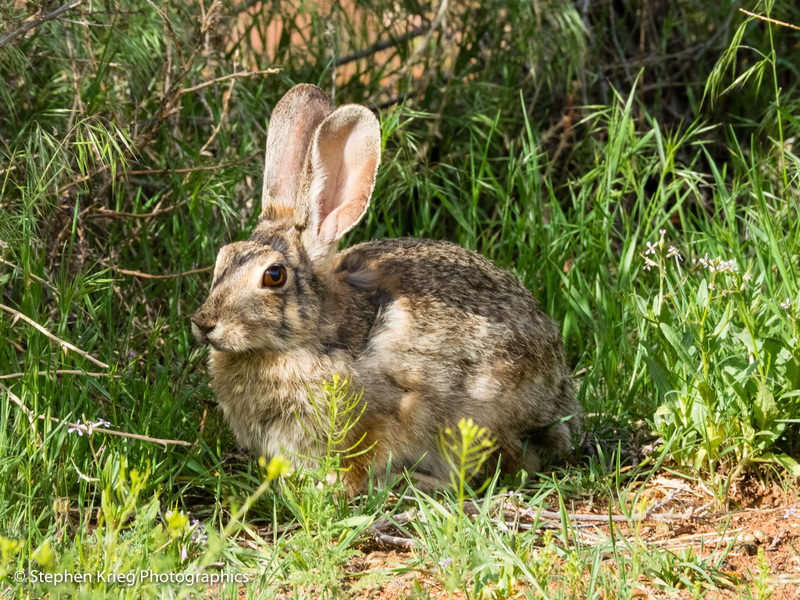 A desert cottontail rabbit was comfortable sharing the spot with me. See what I mean? Desert cottontail rabbit, guardian of the campsite. At sunset time, the sun poured through a single hole in the clouds, lighting up the cliff across the valley. That was so awesome that if nothing more had occurred I would have been elated enough. Sunset spotlight on the cliff base. But no. More yellow-orange sunset light splayed across the cliffs, changing with the lowering sun and the shifting of the clouds. Incredible. And mine, all mine. For one special evening. 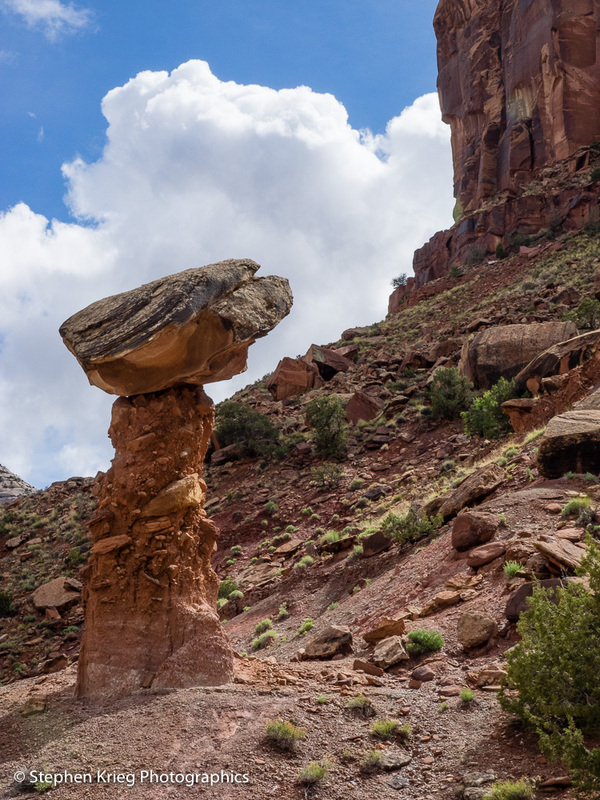 Photo location: Beef Basin, San Juan County, Utah. Hanging rain clouds and rainbow at sunset, Lonesome Valley Buttes, Chino Valley, Arizona.